Be Aware - to understand that the issue of justice is not a black issue, it's a kingdom issue. To learn how the history of racism in America and in the church has tainted our witness to a watching world. Be Redemptive - to grieve and lament what we have lost and to regain our prophetic voice, calling the Church to remember our gospel imperative to promote justice and mercy. Be Active - to move beyond polite, safe conversations about reconciliation and begin to set things aright for our soon-coming King, who will be looking for a WOKE CHURCH. 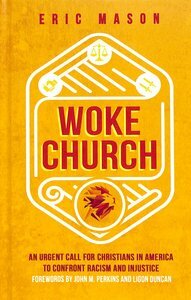 About "Woke Church: An Urgent Call For Christians in America to Confront Racism and Injustice"